The law of the fast is a perfect law, and we cannot begin to approach perfection until we decide to make it a part of our lives. Robert L. Simpson was born on August 8, 1915, in Salt Lake City, Utah. He married Jelaire Chandler in the Mesa Arizona Temple on June 24, 1942. They had four children. Elder Simpson’s first calling as a General Authority was as First Counselor to Presiding Bishop John H. Vandenberg on September 30, 1961. He later served as an Assistant to the Quorum of the Twelve Apostles and as a member of the First Quorum of the Seventy. 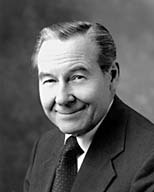 Elder Simpson died on April 15, 2003, in St. George, Utah, at the age of 87. The following article comes from a general conference address originally given in October 1967. Punctuation, capitalization, and paragraphing have been standardized; subheads have been added. … Following the Master’s visit … to the Western Hemisphere, the people were told to continue in “fasting and prayer, and in meeting together oft both to pray and to hear the word of the Lord” (4 Nephi 1:12). So complete and sincere were the people in obeying His commandments “that there was no contention among all the people, in all the land; but there were mighty miracles wrought among the disciples of Jesus” (4 Nephi 1:13). Wouldn’t it be thrilling to enjoy such a condition today! No man or woman can hope to teach of things spiritual unless he is directed by that spirit, for “the Spirit shall be given unto you by the prayer of faith; and if ye receive not the Spirit ye shall not teach. “And all this ye shall observe to do as I have commanded concerning your teaching, until the fulness of my scriptures is given. “For, behold, the Comforter knoweth all things, and beareth record of the Father and of the Son” (D&C 42:14–17). Oh, that every teacher might catch the spirit of this promise and claim this offered partnership, available to all who are engaged in the teaching of truth. There are no better examples of teaching by the Spirit than the sons of Mosiah. The Book of Mormon tells us how they became “strong in the knowledge of the truth; for they were men of a sound understanding and they had searched the scriptures diligently, that they might know the word of God. “But this is not all; they had given themselves to much prayer, and fasting; therefore they had the spirit of prophecy, and the spirit of revelation, and when they taught, they taught with power and authority of God” (Alma 17:2–3). Is there a priesthood or auxiliary leader any place in this Church who wouldn’t give all to possess such power, such assurance? Remember this, above all else, that, according to Alma, they gave themselves to much fasting and prayer. You see, there are certain blessings that can only be fulfilled as we conform to a particular law. The Lord made this very clear through the Prophet Joseph Smith when He declared, “For all who will have a blessing at my hands shall abide the law which was appointed for that blessing, and the conditions thereof, as were instituted from before the foundation of the world” (D&C 132:5). Now, the Lord could not have stated the position more clearly, and, in my opinion, too many Latter-day Saint parents today are depriving themselves and their children of one of the sweetest spiritual experiences that the Father has made available to them. Competent medical authorities tell us that our bodies benefit by an occasional fasting period. That is blessing number one and perhaps the least important. Second, we contribute the money saved from missing the meals as a fast offering to the bishop for the poor and the needy. And third, we reap a particular spiritual benefit that can come to us in no other way. It is a sanctification of the soul for us today just as it was for some choice people who lived 2,000 years ago. I quote briefly from the Book of Mormon: “Nevertheless they did fast and pray oft, and did wax stronger and stronger in their humility, and firmer and firmer in the faith of Christ, unto the filling their souls with joy and consolation, yea, even to the purifying and the sanctification of their hearts, which sanctification cometh because of their yielding their hearts unto God” (Helaman 3:35). Wouldn’t you like this to happen to you? It can, you know! “Moreover when ye fast, be not, as the hypocrites, of a sad countenance: for they disfigure their faces, that they may appear unto men to fast. Verily I say unto you, They have their reward. “That thou appear not unto men to fast, but unto thy Father which is in secret: and thy Father, which seeth in secret, shall reward thee openly” (Matthew 6:16–18). Now, we turn to the most important part of this great law. So far we have only discussed those areas that bless us. The real joy comes with the blessing of the poor and the needy. For it is in the fulfillment of this wonderful Christlike act that we practice “pure religion and undefiled” spoken of by James [see James 1:27]. Can you think of a better or more perfect Christian function than “pure religion and undefiled”? I can’t. “But thou shalt open thine hand wide unto him” (Deuteronomy 15:7–8). Yes, the law of the fast is a perfect law, and we cannot begin to approach perfection until we decide to make it a part of our lives. When you start and stop the fast is up to you, but wouldn’t it be nice to culminate it and be at your spiritual peak for the fast and testimony meeting? How much you give the bishop as a donation is also up to you, but isn’t it thrilling to know that your accounting with the Lord has been paid willingly and with accuracy? … Have you ever noticed how satisfying it is way deep inside each time you are obedient to Heavenly Father’s desires? There can be no equal to the peace of mind that always comes as the reward for obedience to truth. The world needs self-discipline. You can find it in fasting and prayer. Our generation is sick for lack of self-control. Fasting and prayer help to instill this virtue. “Behold, I testify unto you that I do know that these things whereof I have spoken are true. And how do ye suppose that I know of their surety? “Behold, I say unto you they are made known unto me by the Holy Spirit of God. Behold, I have fasted and prayed many days that I might know these things of myself. And now I do know of myself that they are true; for the Lord God hath made them manifest unto me by his Holy Spirit” (Alma 5:45–46).